Springtime next year likely can’t come soon enough for the owners of Scout. 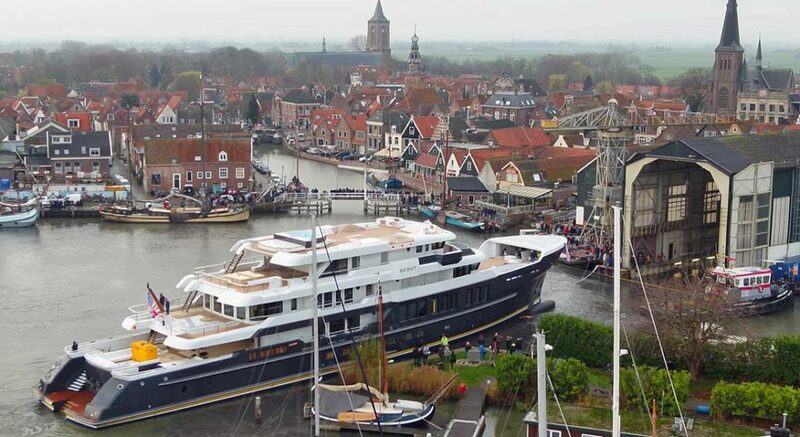 Their long-awaited, super-size superyacht slipped out of Hakvoort’s build shed this weekend. At 209 feet (63.72 meters), Scout is the Dutch yard’s biggest build to date. Full details about Scout should come after delivery. For now, Hakvoort reveals she has four guest staterooms on the main deck. The master suite, meanwhile, occupies the full deck above. Nine crew cabins as well as two staff cabins sit below decks, with the captain’s cabin aft of the wheelhouse. The healthy beam of 38 feet (11.6 meters) should translate to comfortable relaxation areas, including an observation lounge. Given her anticipated 4,800-nautical-mile range at 12 knots under Caterpillar power, Scout should let the owners and guests enjoy a variety of global locales.